Thanks to Target stores down under, we have out first look at the “new” Battle Damage basic figure releases for 2019. 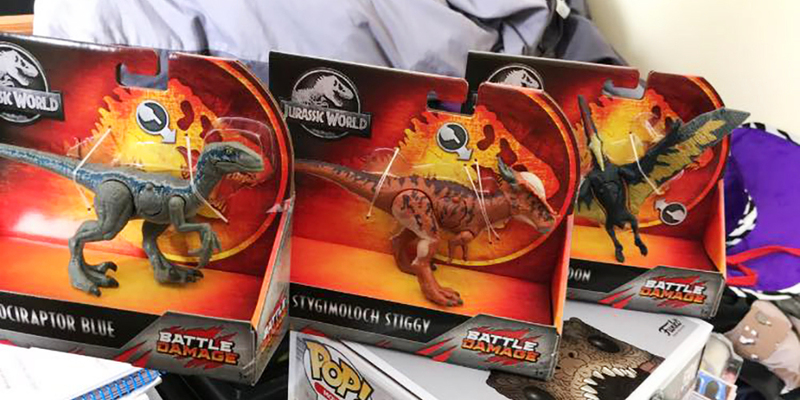 Repacks of Velociraptor Blue and Stygimoloch Stiggy lead the charge, along with a unique Yellow redeco of the Pteranodon figure that was released at the tail-end of 2018 in somewhat limited quantities. For a better look at the base figure, take a look at our Photo Feature covering that release. In the US, we can expect these figures to show up very soon at Walmart stores where Battle Damage remains exclusive. Be sure to follow Collect Jurassic on our official social media accounts (Twitter, Instagram and Facebook), where we will be sharing any local sightings of these and other new Jurassic releases. Image shared via the The Official JP Toys Jurassic Park Page by Kyle A.